Don’t forget to share your #IntentionalLifeProject goal trackers today on Instagram! We will pick a winner at the end of the day! A Modern Commonplace Book is officially one years old. That is so amazing to me! – It has been on 3 blog platforms with 3 painful migrations (Blogger, WordPress.com, WordPress.org). – It has had 4 complete blog designs – all created by me. Apparently, I am “blog tweaker” by nature. – It has had 267 posts – that is one post every 1.2 days! – It had a BOOM last September because of my Trader Joe’s Menu Plan post. August 2013 saw 4,000 views and the following month September saw 55,000 views! – The most viewed post is (not shockingly) the Trader Joe’s post. It has seen 160,000 views. To celebrate with us, use the code BIRTHDAY to get $2 off any sponsor spot this week only! 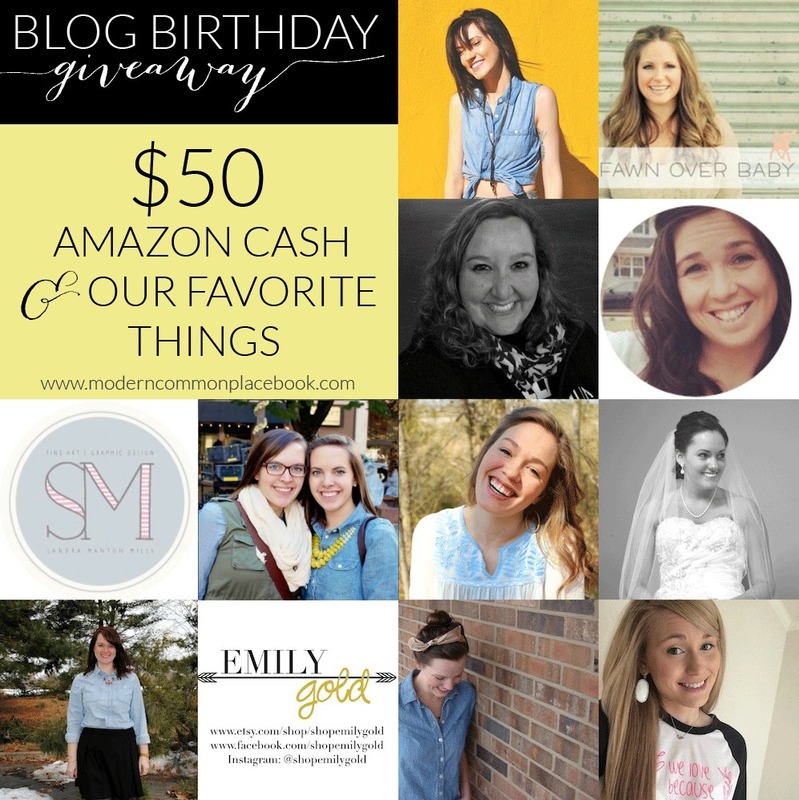 Because of my birthday month, I have asked some very favorite bloggers of mine to help throw a fabulous birthday giveaway! This one’s for you, my readers! Enjoy! 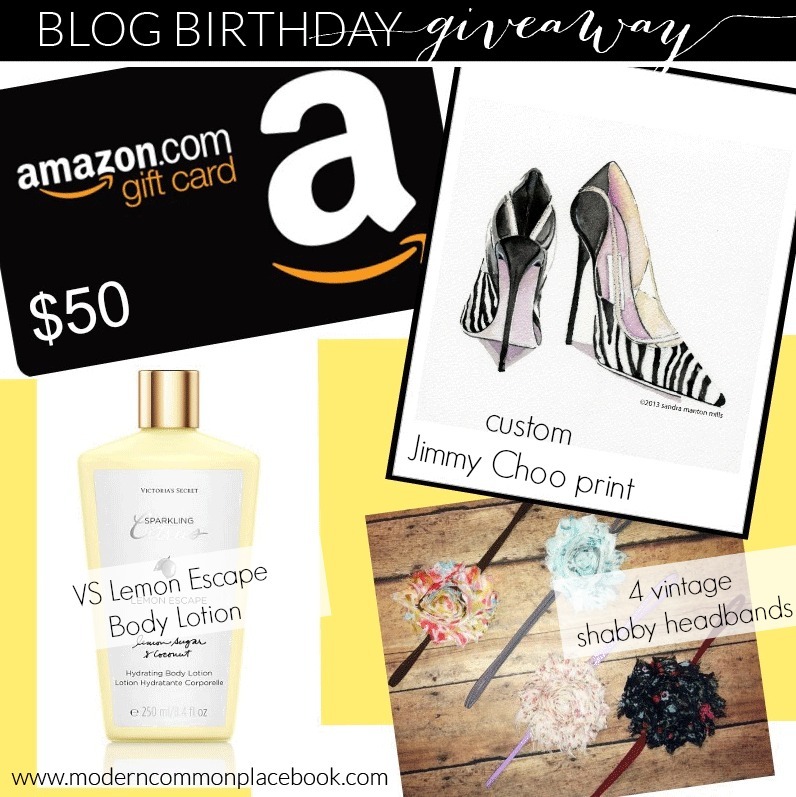 This awesome giveaway could not be possible with these amazing women! I am truly grateful for all their encouragement, friendship, inspiration, and like-mindedness this past year. Make sure you stop each of their sites – and show them your thanks! The Custom Jimmy Choo print is from the awesome Sandra Manton Shop from the Sam and Duke Blog. Sandra is absolutely skilled – and this piece is simply stunning. We all need this hung in our bedroom! See other gorgeous prints here!